Crafting melt and pour glycerin soap looks effortless and is the perfect gift to give any time of the year. Better yet, why not just start making and selling it? Apparently, some over-enthusiastic people think that because glycerin soap is so easy to craft; it can be sold with little to no preliminary testing. After you’ve made your first batch you might be just beginning your way to rivaling Primal Elements, yet you’re nowhere near ready to sell. Melt and pour soap base is premade. This means that you can buy a small amount, cut off a piece, and use it to wash your hands. However, most of us see this as just the first step into creating wonderful looking bars, slabs, domes, rounds, squares or rectangles of colorful and/or beautifully scented soap. This can only be done if your soap base is well made. How can you find out? First of all, stay away from soap base with a very long list of ingredients. Don’t purchase soap base that doesn’t have any ingredients listed. The manufacturer is required by law to list what is in that soap base. If you’re shopping online, make certain that the ingredient list is posted on the web site. If not, go to another site. As with food, the ingredients listing on soap bases begin with the most prominent component listed first. For melt and pour glycerin soap base you’ll want to see the word GLYCERIN within the first two or three ingredients. If not, you might just not have a great product, or you may have a coconut soap base. There is nothing wrong with coconut soap, it’s just a bit heavier than glycerin soap, and it’s not translucent. The most common myth is that glycerin soap doesn’t contain lye. Yes it does. ALL soap contains lye. Lye is mixed with fats and water and in the case of melt and pour, other clarifying ingredients such as sugar, alcohol, propylene glycol and sorbitol. The soapy fact here is that once you purchase the glycerin soap base YOU don’t have to use any lye. And that’s what’s so appealing to us. Time and again I’ve read of people who claim they use 100% Glycerin soap. That’s impossible as it would be a jar of a clear, sticky plant-derived substance that’s devoid of lather and cleansing ability. What melt and pour soap contains is 100% plant glycerin – and usually at around a 20% rate. Some soap bases contain more, others less. But even at about 20% that is what helps this soap achieve its clarity and its softness – as well as its shorter lifespan in the tub, sink or shower. First off, learn what do these initials mean. F.O. = Fragrance Oil. E.O. = Essential Oil. Now, what’s the difference? A fragrance oil contains up to 200 components to make it smell like a fresh-baked slice of chocolate fudge brownie, a luscious ripe raspberry, or a just-picked jasmine flower. Fragrances often contain natural ingredients, but also a lot of synthetic ones. They’re created in a lab, and are less costly than essential oils. They are also more plentiful. Another advantage is that you can obtain your favorite perfume or cologne for just a few dollars an ounce! Essential oils derive their substance directly from nature. Lemon oil comes from the expressed rinds of the fruit, rose essential oil is from the petals of this lovely flower, and sandalwood comes from the wood of the Indian, Indonesian or Australian-grown tree. Essential oils can be reasonably priced at only a few dollars per ounce [citrus scents], to more than $350 for Bulgarian rose otto from the Valley of the Roses or a ‘mere’ $197 for some skin healing Immortelle from the island of Corsica. To use such expensive oils in a bar of soap isn’t necessary. Pure essential oils are best used in a lotion or cream – so they can be absorbed into the skin and not washed away. Tempting as it may be, refrain from adding that pureed avocado. Don’t put in those dewy lavender or rose buds unless you want to see them turn brown before your eyes. A fresh slice of cucumber would look gorgeous suspended in a translucent bar of soap – until mold grows over it. Even if you sprinkle in Fruit Fresh or powdered benzoin, even if a book or online article instructs you to do so – DON’T ADD FRESH FRUIT OR VEGETABLES. You can add dried herbs such as peppermint or rosemary, but expect them to turn brown within a few days or weeks. This is because glycerin soap contains up to 10% water. Water causes pretty dried lavender buds and green leaves to turn that color also. No, you don’t have to take a test – not even a quiz! You just have to be sure of what you’re doing in the kitchen or soap room. You have to be comfortable making your soap before you sell even a single bar. Don’t have your first batch be a complicated multi-color embed project. Start with a simple soap shape and use one color and one scent. You have to be certain that the colors won’t run or fade. Will your fragrances hold up for more than a month? Does your soap sweat? Will that lovely white vanilla or coconut soap remain that color or will it turn chocolate brown in a matter of weeks? You are the first person to test your soaps. Then your family. Let a few friends, neighbors and coworkers in on your soaping hobby that may just turn into quite the business. Anticipate questions from testers/potential customers. Know the answers. Do this for at least six months, but a year is even better. Remember, you need to be happy with your products, as you’re now the soapcrafter. When you plan to sell your handcrafted glycerin soap creations this entails naming more than each type of soap you make; you’ll become a business owner. For more information on this large and important aspect, check out the book Handmade for Profit! by crafts industry expert Barbara Brabec. 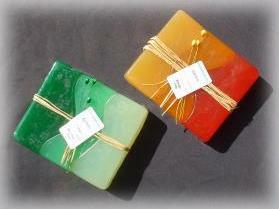 Author Lisa Maliga is the owner of http://www.everythingshea.com and has been handcrafting glycerin soap since 1998. Her company, Everything Shea Aromatic Creations, offers a fragrant selection of designer shea butter glycerin soaps, exclusive Whipped Shea Butter, and unique SoapCakes to personalize for gifts or promotions. Whipped Shea butter is custom made and preservative free!